Photo: Listed on the National Register of Historic Places in 1972. It is also a contributing resource in the El Cid Historic District. 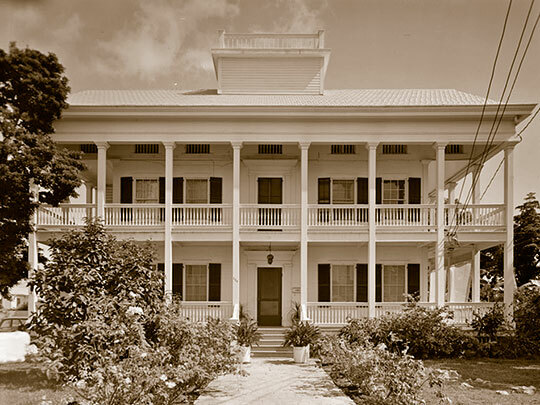 Photographed by J. F. Brooks, 1967, Historic American Buildings Survey [HABS FL-181], memory.loc.gov, accessed October, 2013. The Monroe County Courthouse is located at 302 Fleming Street, Key West, FL 33040; phone: 305-292-3423. Monroe County was created in 1823 and named for the 5th U. S. President, James Monroe. The Florida Keys, that are within Monroe County, are a chain of islands located in Monroe County that are connected by 110 miles of US Highway 1, extending from Key Largo to Key West, representing the most southerly point of the continental United States. The surrounding water is designated an Outstanding Florida Water and includes the Florida Keys National Marine Sanctuary, the second largest marine sanctuary in the United States. Monroe County Comprehensive Plan Update, September, 2013, www.keyscompplan.com, accessed October, 2013.